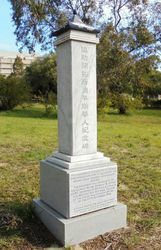 A monument erected by the Chung Wah Association commemorates Chinese pioneers. The Chinese were introduced into the colony as labourers and did not receive very formal funerals as they were generally treated as outcasts in both life and death. Many Christians refused to allow 'heathen' Chinese to be buried in consecrated land, and others stipulated that they be buried in fenced off 'Chinese' or 'alien' areas. A letter written by Acting Commissioner of Crown lands, J.W. Brooking to the Colonial Secretary in September 1888 asked that the northern half of Perth Town Lot E69 be gazetted as a Chinese Cemetery. Until then it had been designated as a general cemetery reserve. 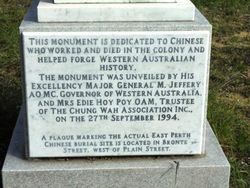 Unlike the other cemeteries, the Chinese one was not vested in the Chinese community as there were very few Chinese living in Perth at the time. In fact, it was not until the 1914 that a Chinese association was formed and began to lobby the Government. A plaque was also placed at the site of the original Chinese cemetery which was reclaimed for public use and made available to the Education Department in the 1950s. On The 27th September 1994. Street, West Of Plain Street.